It's been over a month since the last installment in this challenge, and this arrival is from one of the countries I thought would be the hardest to source. For those who don't know San Marino is a small country located entirely within Italy. San Marino has no naturally level ground, it is an entirely hilly country (apparently...). There is some debate over whether this is an Italian beer or a beer from the tiny country of San Marino. Beeradvocate has the beer listed as being from San Marino and so that's good enough for me. This is apparently an amber double malted beer, if my Italian is any good. I found this one at the International Beer Store in Perth, online of course. I think I've mentioned my fondeness for a ceramic topped beer bottle before on this blog but I will do so again, I really like the popping noise they make and the indication of the freshness they keep. 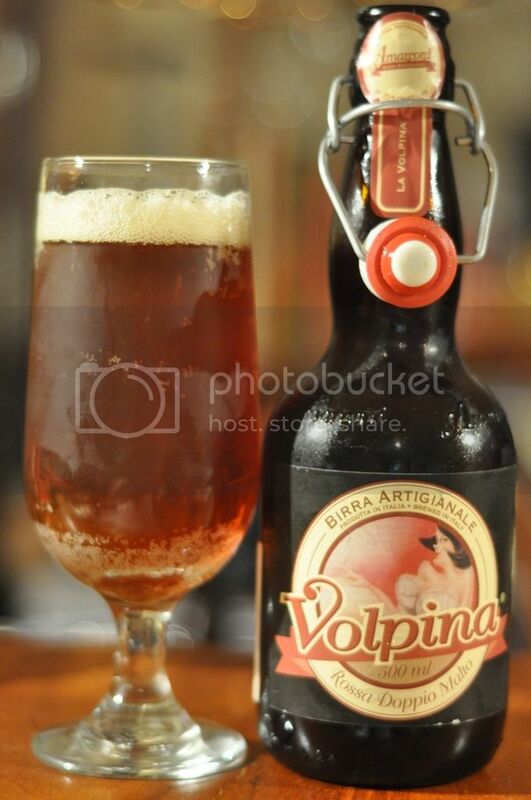 Enough of that though, the Volpina pours a light amber colour with a small beige head. The head is quite bubbly and has almost no retention, it also leaves no lacing and actually has very little carbonation despite the noticeable pop, upon opening. If I'm being honest it's a disappointing looking beer. The nose is definitely better than the appearance of this one. Amarcord have produced quite a pungent beer, which I applaud. There is a strong bready malt aroma with hints of caramel and citrus also quite prominent. Hints of warming alcohols are also present, as is a slightly bitter aroma which I cannot quite place. The ambition of the brewer is to be commended and this is actually quite a nice smell amber ale, typically a style not prone to nice aroma's. The taste is another level up again! The intentions of the brewer are quite clear, that flavour is paramount and he will stop at nothing to acheive that aim. This shows through in the flavour which is both strong and delicious. Lots of malts are present (as expected in a double malt amber ale), which are of both bread and caramel varieties. It's surprisingly fruity as well and there is a very small hop bitterness towards the end, however it could just be overshadowed by the extreme malt flavours. After a less than inspiring start the beer actually turned out really well. The flavours are strong and it's surprisingly easy to drink, despite both the alcohol content and a slightly thick mouthfeel. The low carbonation actually helps with the drinking, however I believe it would be difficult to drink many of these in a session. On the scale of things it's quite a nice amber ale, however with the price factored in I won't be buying it again. However a good effort from the 2nd smallest country in this challenge, worth a try if you can get your hands on it.